Steve Perrault is vastly more complex than his present title of “contemporary artist” suggests. S teve Perrault holds graduate degrees in theology, clinical psychology, and art education. He attended Parson’s School of Design. A full-time painter for the last 16 years, he has a work history as a psychotherapist, jail and prison chaplain, and art instructor at the primary, secondary and college levels. Steve Perrault, a Minnesota native, has been featured in over 50 national and international publications, including The New York Times Magazine, ARTnews (twice), American Art Collector, and Southwest Art. He has been a finalist in The Artist’s Magazine’s annual “Best Art” competition an unprecedented nine straight years, was the subject of a feature on NBC Dateline television program, and is in collections around the world, including Academy Award-winning film director William Friedkin, Paramount Pictures Chairman Emeritus Sherry Lansing, The Smithsonian, Washington, DC, and the Environmental Protection Agency National Headquarters. 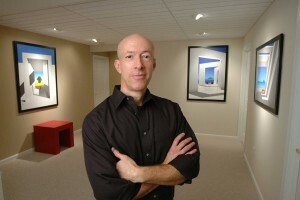 Steve is represented by numerous galleries in the United States and Europe. He is married and lives in Harrisburg, Pennsylvania with their Basenji, Bart. My education and work experience as a psychotherapist, jail chaplain, and art instructor, strongly inform my paintings by incorporating my particular involvements and symbolic thinking into a unique iconography. Art is advocacy. My works characterize deliberate focus and stability, often missing in today’s superficial and shifting technological climate. Architectural elements derive their meaning through form and context. The simpler its expression, the deeper is the impression it makes. Simple and formal structural components can provide a visual language that encourages a sense of order and harmony. Yet beneath it lies a deeper conversation about the perception of structure as metaphor. I create passages of inside-outside space, lightness and darkness, containment and expansion, screening and distinction. These characteristics and dualities are mediums for personal meditation. Be awake. Stay curious. Keep learning.